CJ E&M hosts KCON 2016 France! "Korea Premium" sweeps Paris KCON 2016 France marks the first time KCON has come to Europe! Let’s take a look at the KCON 2016 France, where Korean culture has touched the hearts and minds of French people! European fans of Korean culture! Come to KCON! ▲ Bonjour! French fans of Korean culture, nice to meet you! KCON 2016 France, held on June 2 in AccorHotels Arena in Paris, France, was a great success. This year's KCON was sponsored by CJ E&M and was particularly significant as it was the first time the event had taken place in Europe. It was a great chance for Korean Wave fans from France and other European countries to experience K-Pop in person. When people heard that KCON 2016 was going to be held in France, many were surprised that the Korean Wave had reached Europe. In fact, Europeans' enthusiasm for K-Pop is deep-rooted. Big Korean entertainment management companies such as SM and YG often work together with songwriters from Europe to appeal to European fans. A large number of those posting K-Pop cover dance videos or K-Pop reaction videos on YouTube are, in fact, Europeans. Libération, a respected French daily newspaper, featured an in-depth story about K-Pop on April, 2016. It covered a topographic map and the future direction of K-Pop for readers interested in K-pop and the Korean Wave. Separately, the Korean Cultural Center in France is expected to open a "K-Pop academy" in September to give fans a chance to enjoy Korean pop music. Korean TV dramas, the essence of K-Culture, are very popular in Europe. At the French broadcast convention, MIPTV 2016, held in April, Korea's 34 broadcast and animation companies promoted broadcasting programs, particularly the latest hit dramas such as Descendants of the Sun and Please Come Back, Mister. Meanwhile, French private broadcast TF1's new channel televised Korean dramas, including Kill Me Heal Me, Healer, My Love from the Star, and Dream High. ▲ The K-beauty wave has reached France, the "Mecca of Beauty." K-Food and K-Beauty are also winning fans in France. Korean food has long been loved by Europeans for its delicious taste and health benefits. Korean cosmetics companies have long been recognized in Europe for their top-level technology, with both BB cream and "Air Cushion" having been exported to France, the home of beauty. As of 2015, France is the biggest importer of Korean cosmetics within the EU. Christian Dior has formed a partnership with a Korean cosmetics company for technology exchange, and a product made by a Korean cosmetics company is now being sold under the Yves Saint Laurent brand all over the world. K-Culture has recently attracted great attention from Europeans. KCON 2016 took place in Paris, where public interest in K-Culture is the highest in Europe! This is great news for the country's K-Pop fans. KCON 2016 France is contributing to the creation of "Korea Premium"
▲ Wow~! How amazing is their Hangul! 12,000 KCON Concert tickets sold out within just three hours of becoming available on April 29, and within just an hour on May 9. 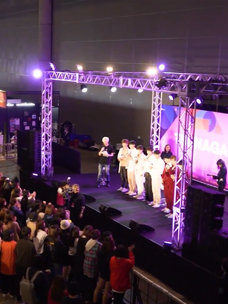 As many as 13,500 Europeans attended the KCON Convention on June 2, the day of the KCON Concert, showing how strong the craze for the Korean Wave is in Europe. 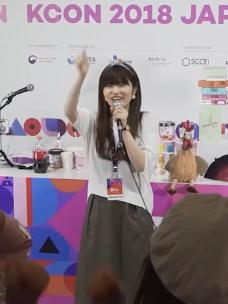 ▲ At KCON, visitors were able to enjoy many aspects of Korean culture. This year's KCON is significant in that it marked the 130th anniversary of diplomatic ties between Korea and France, and contributed to the creation of "Korea Premium," leading the spread of Korean Wave to Paris, the heart of global culture. Even President Park Geun-hye attended the event while on her state visit to France. According to a 2015 survey on the current status of the Korean Wave, announced by the Korea Foundation for International Culture Exchange (KOFICE), 65.8% of French respondents recognize Korea as a cultural powerhouse. ▲ Enjoy "M Wave," foreign K-Pop channel! Displaying the diverse taste, style and humor of Korea as a cultural powerhouse, KCON 2016 France was awash with reporters from influential daily newspapers including Le Figaro, 20 minutes, and Nice Matin; as well as France's three major broadcasters, including TF1; Spain's state radio Radio Nacional de Espana, and culture magazine Vice. The press covered KCON to get the inside scoop on the Korean Wave. Enjoy K-culture with pleasure and excitement! Government organizations (Ministry of Culture, Sports and Tourism, Small and Medium Business Administration (SMBA), Ministry of Agriculture, Food and Rural Affairs, Ministry of Education and National Institute for International Education), public organizations (Korea Creative Content Agency (KOCCA), Korea Tourism Organization, Large and Small Business Cooperation Foundation and Korea Agro-Fisheries and Food Trade Corporation), and the Korea International Trade Association attended the KCON convention in force. ▲ Korean spicy ramen is a world star! ▲ The “Get It Beauty” class led by makeup artist Woo Hyeon-jeong was also popular. The Ministry of Culture, Sports and Tourism and KOCCA operated a K-Content booth where this year's 25 top cultural products, such as the hanbok (the traditional Korean dress), craftwork, and traditional food were displayed. The Cultural Creation Venture Complex also offered visitors a great experience with various projects. The Ministry of Culture, Sports and Tourism and Korea Tourism Organization operated a K-Tour booth to provide a VR experience of Korea and a promotional video. SMBA and Large and Small Business Cooperation Foundation put on a K-Goods booth to display 35 products from small and medium companies involving beauty, fashion and innovative everyday items. CJ also installed a separate booth to show major products of Bibigo, its global Korean food brand, with visitors able to sample the culinary delights on offer. French visitors particularly loved K-Food. Many people tasted the Korean “agrifoods” exported to Europe as displayed by the Korea Agro-Fisheries and Food Trade Corp. The French also showed a positive response to delicious and healthy snacks such as Bibigo’s laver snack and bread sticks flavored with Bibigo's gochujang (red pepper paste) launched by CJ Cheil Jedang. ▲ Delicious finger food dessert, a French-Korean fusion! The Korean food experience zone was also highly popular. It featured drinks, desserts and formal dinners that embodied Korea’s four seasons, as well as finger food that offered a real fusion of Korean and French food. The food was served in traditional earthenware and brassware to allow visitors to enjoy authentic Korean culture. ▲ BTS and their excited fans! ▲ Wow, they came to France! They're really cool! ▲ F(x) is one of the most popular K-Pop groups in France. The undoubted highlight of KCON was the K-Pop concert! The M COUNTDOWN Concert was held to celebrate KCON in Paris, with 12,000 European fans cheering with joy at the music. ▲ The spectacular stage illuminated by the colors of France's national flag. Fantastique! ▲ Shinee wowed French fans. ▲ Block B gave a powerful performance! During the spectacular performances from of six K-Pop groups – Shinee, F(x), BTS, Block B, F.T. Island and I.O.I – the crowd of KCON 2016 France sang along as one. 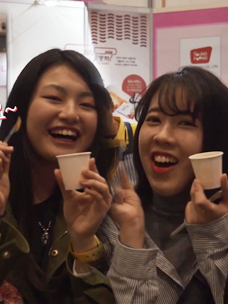 European fans showed their great passion for K-Pop stars, singing the Korean lyrics with the correct pronunciation, even though Korean is not an easy language to pronounce, and dancing together in excitement. The Korean Wave is not just a concept. It’s a living and breathing phenomenon, as can be seen in the photos from KCON. What was obvious at KCON 2016 was that culture has the power to bring people together as one. This is the value of the Korean Wave. Since KCON was first held in Irvine, US in 2012, it has taken place once or twice a year in different countries, such as the US and Japan, showing people around the world various aspects of Korean culture, as exemplified by K-Pop. KCON has definitely established itself as a vehicle to spread not only K-Pop, but also the proud and original K-Culture as a whole, including Korean food, movies, dramas, tourism, original technologies, and agricultural products. 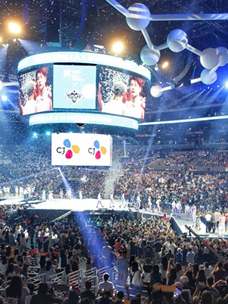 KCON is committed to reaching Korean Wave fans across the world and letting them experience K-Culture for themselves. In 2016, it was held in Abu Dhabi, its first time in the Middle East, which was followed with its Paris debut, its first time in Europe. KCON is now recognized as a major and significant event in the globalization of Korean Wave. "We are happy to celebrate the 130th anniversary of diplomatic ties between Korea and France, and at the same time deliver the passion of KCON to Paris, the heart of global culture," said Shin Hyung-kwan, head of CJ E&M Mnet content division, who supervised this event. Whenever the fun, taste, style and excitement of Korean culture are enjoyed and shared anywhere in the world – that is a stage for KCON. Korean Wave fans experience unforgettable moments of Korean culture with KCON and, filled with enjoyment and passion, it will continue to play an active role in the spread of K-Culture all over the world.